The emergence of larger entities from smaller entities: This fairly self-explanatory process is best exemplified in the emergence of multi-cellular organisms, such as us, from single-celled organisms (for one of the largest, see the Valonia ventricosa). The division of labour: Derived from a long history in philosophy (see Xenophon) and coined in economics (see Adam Smith’s The Wealth of Nations), the basic concept is where there are many specialised component parts, each performing their own niche function, that make up a system. Furthermore, specialisation can emerge from previously independent units, as appears to be the case where single-celled organisms came together and, over evolutionary time, became increasingly specialised in multi-cellular organisms: through cellular differentiation humans have cells ranging from those specialised for the transport of oxygen (red blood cells) to the processing and transmitting of information through electrical and chemical signalling (neurons). As Barton et al (2007) note: “None of these cells could survive on its own, but as part of an integrated organism together they achieve things that no aggregation of homogeneous cells ever could” (pg. 231). The loss of independent replication: When smaller entities come together to form a larger entity these components can become inter-dependent; one consequence being the loss of independent replication. The ancestors of mitochondria, those organelles that provide chemical energy for the cell in the form of adenosine triphosphate (ATP), were once independent of the cells they now inhabit (probably as endosymbiotic prokaryotes). Mitochrondria are therefore dependent on the replication properties of the cell. Increased inter-dependency can cause fragility: It refers to Maynard-Smith & Szathmáry’s concept of smaller entities disrupting the development of the larger entity. For example, our dependence on cellular replication makes us fragile to cancer: where damage to the cell growth controls and the reversal of differentiation can lead to fairly motile cells that disrupt normal tissues. (N.B. This title was not used or referred to in the original work. It was taken from my reading of Nassim Nicholas Taleb’s books and papers). Novel ways of transmitting information: Lastly, and perhaps most importantly, evolutionary transitions see a new way of transmitting information. The translation of DNA into protein allows for the basic information about an organism’s structure and function to be passed onto the next generation. Put simply: It is through gene expression that we see the genotype give rise to the phenotype. It is here where we get to language, which, according to Maynard-Smith & Szathmáry, is a transition allowing for the transmission and replication of cultural information. 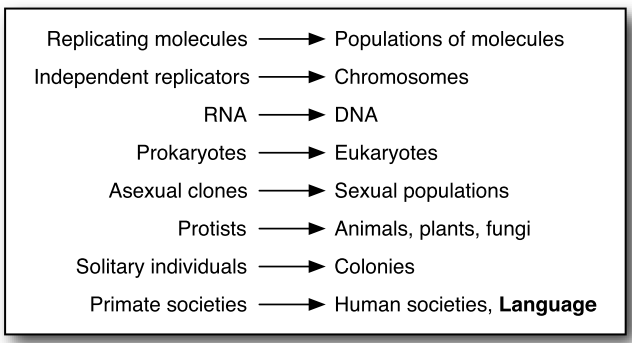 For Maynard-Smith & Szathmáry, language is viewed as a phenotypic replicator (for another example, see prions), but what makes it qualitatively different is the ability to support unlimited heredity: “A crucial distinction is between systems of ‘limited heredity’, in which only a few distinct states can be transmitted, and systems of ‘unlimited heredity’, capable of transmitting an indefinitely large number of messages” (pg. 13). Such is the position of Professor Simon Kirby in a forthcoming book chapter on the Evolution of Linguistic Replicators. Specifically, he raises the following question: what, if anything, does placing language among the major evolutionary transitions tell us about the evolution of language? One solution is to conceive of language as being an adaptation for communication. Pinker & Bloom (1990) offer us the most popular example here, where communication is a process of directly mapping meaning onto external signals during both production and reception through two information-processing devices. I’m not convinced such accounts capture the semantic and pragmatic realities of communication. In fact, if we were optimally designed for efficient information transfer then language would probably be a very different beast indeed. From an information-theoretic perspective it is far more efficient to make use of multiple centre-embedded clauses to express propositions with multiple dependencies. Try parsing Scott-Phillips’ (2010) example of The man the boy the woman saw heard left. Pinker & Bloom’s response to such challenges is that constraints on natural selection will lead to good, as opposed to perfect designs. And whilst this is certainly true, a more parsimonious explanation may simply be that information transfer is just one facet of our broader pragmatic competence — and it is here where we should look for evidence of design. If you consider an utterance, what information does that utterance convey? Most obviously, it conveys semantic information, and ultimately this is the information that MS&S are talking about in their discussion of unlimited cultural heredity. In other words, utterances carry content. But there is another kind of information that can be conveyed by any linguistic production, and that is information about the linguistic system itself. Along with content comes form. When I produce the sentence “these berries are good” I may be propagating cultural information about the edibility of items in the environment via the content of the sentence. At the same time I may also be propagating information about the construction of sentences in my language: its phonology, its lexical entries, its syntactic structure and so on (pg. 2). Following on from this perspective, language is not only a mechanism for cultural replication, it is itself a culturally transmitted system. For Kirby, the process of language acquisition adopts a reverse engineering solution: where a child infers the workings of language through exposure to its linguistic environment (mostly adults producing utterances). Linguistic transmission, then, involves numerous repeated instances of reverse engineering. Termed iterated learning (see here and here), this process of phenotypic replication through repeated cycles of production and perception/learning “may drive both evolutionary transitions of language from one qualitatively different state to the next and at the same time the normal process of ongoing change within each of those evolutionary stages” (pg. 5). So, even though language is itself a major transition, an extension on this idea is to also consider major transitions within the cultural evolution of language. Like in Maynard-Smith & Szathmáry’s transitions, these linguistic transitions are characterised by new divisions of labour and a loss of independent replication, with Kirby citing three salient examples: the ability for combinatorial phonotactics, the emergence of compositionality and the split into a contentive-functional lexicon. The first of these refers to the movement away from vocalisations with arbitrary trajectories through the acoustic/articulatory space toward combinatorial phonotactics: “the systematic reuse of speech sounds in the building of complex vocalizations [and the] formation of cultural rules and patterns of sound combination” (Oudeyer, 2005). Pairing these complex vocalisations with structured meanings then follows through into the second transition: where we go from holophrastic phrases (a string of phonemes in a sentence corresponds to the whole meaning) to compositional utterances (the meaning is inferred by the meaning of sub-parts of that string and the way they are put together). It is from these two transitions we have the basics needed for the evolution of “major syntactic categories, word order universals and recursion” (Kirby, in press, pg. 9). Each of these two topics deserve a post in themselves, and it’ll probably be something I come back to in the future, but for now I want to focus on the last of these proposed transitions: how language went from a monolithic to a contentive-functional divide in its lexicon. So far, the two major transitions take us to a system where “each word maps onto part of the content of an utterance and combines with other words to compose a whole message” (pg. 12). This pretty much describes contentive elements such as nouns, verbs, adjectives etc. These tend to form open-classes in a language’s lexicon, which includes linguistic variants appearing in a wide variety of syntactic environments, being morphologically free and “syntactically and semantically coercible” (Cann, 2001, pg. 15). In natural language, however, there are also functional items to consider. These take shape in the form of determiners, complementisers, prepositions, markers of case, tense, number etc, and tend to form the closed-classes. Even the way they are processed in the brain shows differences: “neuronal assemblies corresponding to function words are restricted to the perisylvian language cortex, while those corresponding to content expressions include neurons of the entire cortex” (Cann, 2001, pg. 14). It should be noted that there is considerable debate over these issues. In particular, only a close correlation exists between open-class/closed-class and contentive/functional words. The terms are not synonymous, as evident in auxiliary verbs forming a closed subclass of verbs, whilst functional expressions, such as the adverbs here and there, are often considered to be open-class (ibid). These issues aside, and the central point being made is one where there’s an observable difference between contentive and functional lexical forms in their distribution. This is one example of the division of labour in language: “Prior to the transition, the lexicon contained contentive elements only distinguished by broadly semantically defined syntactic categories. Afterwards, the lexicon specialises into an open class of elements carrying content, and a closed class of those with a grammatical function” (Kirby, in press, pg. 12). As Kirby notes, there is not much in the computational modelling literature on the contentive-functional divide, but one area that might shed some light on the situation is grammaticalisation: “how lexical items and constructions come in certain linguistic contexts to serve grammatical functions or how grammatical items develop new grammatical functions” (Hopper & Traugott, 2003, pg. 1). A largely unidirectional process, grammaticalisation is a well-developed concept within linguistic typology and language change, and (mostly) involves simultaneous changes across phonological, morphosyntactic, and functional levels. There is also a distinction between syntagmatic and paradigmatic processes (Croft, 2010b). Various explanatory models proposed offer different conceptual stages through which grammaticalisation takes place. In the future, I’ll hopefully have a contributor who can expand upon, and provide a better explanation of, the work that’s taking place in this field. For now, I’m going to stick with one general model, the Lüdtke-Keller theory, and its three phases of grammticalisation: periphrasis, fusion and erosion. An often used (and often bemoaned) example to demonstrate the Lüdtke-Keller Cycle is the periphrastic future be going to. At the periphrastic stage, a speaker uses a more elaborate expression to communicate a situation — either to avoid misunderstanding or to be expressive. Using our example, this involved a combination of the motion verb (go) and the purpose clause (to + infinitive) to express a future function: “The construction be going to probably spread from the closely related meaning of a motion event undertaken with an intended future outcome (the purpose clause)” (Croft, 2010b, 87). At the fusion stage, this periphrastic construction becomes a conventional or idiomatic linguistic routine: e.g. the use of the specific verb go and the present progressive form become fixed. Lastly, erosion occurs: both phonological and morphosyntactic elements are reduced, leading to the loss of syntactic independence and phonological affixation; demonstrated in the contracted form of be plus the reduced gonna [gʌnə] (see Croft, 2010a; 2010b). It’s clear grammaticalisation is a process taking place in language change. As a result, Kirby puts forward the following claim: the phenotypic replication of language, through iterated learning, often leads to the emergence of new replicators with a specifically syntactic function. Extrapolating this to the cultural evolution of language is territory to be explored, with future work firmly focused on the following: “What remains an open question at this stage is if we can demonstrate that the same process lead to the emergence of the very first functional elements in the longer term emergence of language. In other words, did the process of grammaticalisation lead to the original split in the lexicon in the first place?” (Kirby, pg. 13). I like the idea that the evolution of modern language involving more than one major transition. This should be clear from the fact that many other species (primate and non-primate) can handle aspects of language such as induction, vocal learning, learning arbitrary symbols etc. In relation to this, see the last part of my post on Bayesian Bilingualism under ‘Bilingualism as a Major Transition’ which argues that the ability to make many-to-many signal-to-meaning mappings is a (very old) transition required for modern langauge. Heine & Kuteva (2007) have a volume in the OUP Evolution of Language series “The Genesis of Grammar”. They apply grammaticalization theory, especially influenced by Talmy Givon and broad crosslinguistic surveys like Bybee, Pagliuca and Perkins (1994), to trace how open and closed class words would have evolved in a proto-language in layers. The first layer is nouns, the second verbs, third adjectives, and so on until you get clause subordination and recursion. Grammaticalization is an interesting field and I have been coming around to the idea of applying it in my MA dissertation. As an aside to something I’ve been considering lately, researchers in this area are certainly aware of Kirby, Christiansen and Wray but tend to emphasise that the engines of grammaticalization are in adult language usage, not in child language acquisition. If anything, child language acquisition helps solidify and streamline innovations which have already taken place in adult or adolescent usage. I don’t know how that would sit with Kirby et al., but my impression is that it is something of a difference. Anyway I had to get that off my chest. It’s posts like this that take me away from my studies! @Sean: already read your post — I was meant to link to it in my introduction, but forgot. I definitely think you’re onto something with the many-to-many signal-to-meaning mappings as being the default setting of a learner, and thus a necessary transition required for language. As for your second point: I agree with what you say: to an extent, children do help solidify and streamline innovations etc, and it’s adults who appear to primarily generate this first-order, synchronic innovation. In fact, this is definitely the position of utterance-based theorists, such as Croft. However, I do think Kirby et al appreciate the importance of adult learners in driving language change (and, by extension, processes like grammaticalisation). Indeed, Wray & Grace (2007) stress how inter-language contact between adult-learners influences the trajectory of a language in an exoteric communicative context.